Comments: This is the story of three extraordinary Hawaiian women who helped revive Hawaiian culture when it was perilously close to being lost. It was a time when the monarchy had been overthrown, the Hawaiian language banned from public places and schools, and the Hawaiian heartbeat of hula forced underground. Mary Kawena Pukui, `Iolani Luahine and Edith Kanaka`ole combined commitment to Hawaiian history with art and aloha, to reignite the flame of tradition. 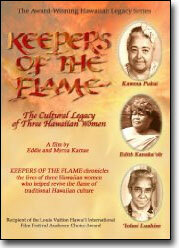 Each planted seeds of the Hawaiian cultural renaissance. Kawena as a history and language expert, teacher and author, `Iolani as a chanter, cultural icon and "high priestess of hula," and Edith as a songwriter, teacher and founder of the traditional school of hula, Halau O Kekuhi.